Having worked in a quilt shop for over 9 years, I made the decision to start my own longarm business in 2009. I enjoy working at home on my APQS Millennium. 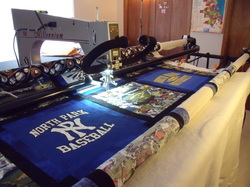 With over 10 years of longarm experience, I can finish your quilt with a beautiful pantograph or custom quilting. I have hundreds of different threads (Superior, Aurifil, Signature, Glide, Isacord) in beautiful colors and over 150 pantographs to choose from. I carry Quilters Dream Select, Poly and Wool batting and Hobbs Heirloom 80/20; you're always more than welcome to bring batting of your choice too! If you are in a hurry and don’t have time to apply the binding, I’ll be more than happy to do that too. Please don’t hesitate to contact me either by phone or e-mail for a quote or any questions you might have.